From small to big commercial chicken farms, the poultry industry in Alabama has an annual economic impact of 15 billion dollars. Commercial poultry accounts for over 65% of the annual farming revenues in the state. With summer a day away, and the temperatures heating up, technology has helped the industry improve than in decades past. Chad Grant is the owner of Southern Comfort Farms in Fort Deposit. He explains how his chicken houses now have a cooling system that keeps the chickens in a comfortable atmosphere. 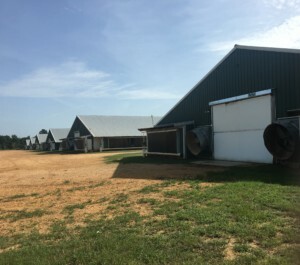 Demand for poultry is continuing to grow and so are the sizes of chicken houses. Johnny Adams is the CEO of the Alabama Poultry and Egg Association. He says technology advancements make it easier for farmers to take on problems that could occur. Grant says that he is able to get alerts on his IPad, which helps detect problems in his chicken houses. This allows him to focus more on the chickens. While the summer heat may not pose as big of a threat as it once did a decade ago, there are new challenges farmers face. Adams explains just how big of an impact the industry has in the state. Alabama’s poultry industry employees more than 86,000 workers in the state. There are approximately 2,775 poultry producers in Alabama, located in 49 counties. They produce pullets, breeders, and broilers- products of hens and roosters. Alabama is second nationally, only to Georgia, in broiler production, producing 21 million broilers per week.